This easy fruit pizza recipe from scratch includes a homemade cookie dough "crust," fantastic cream cheese "sauce" and topped with fresh juicy fruit. Tip: For a quick crust, use one package of ready made sugar cookie dough rolled out to fit a pizza pan. Use an assortment of fresh fruit such as bananas, peaches, blueberries, kiwi, pineapple, and strawberries. In a large bowl, cream together the butter and 3/4 cup sugar until smooth. Mix in egg. combine the flour, cream of tartar, baking soda and salt; stir into the creamed mixture until just blended. Press dough into an ungreased pizza pan. Bake in oven for 8 to 10 minutes, or until lightly browned. Cool. In a large bowl, beat cream cheese with 1/2 cup sugar and vanilla until light. Spread on cooled crust. Arrange desired fruit on top of filling, and chill. When the crust is baking, grab a large bowl and mix together the vanilla, powdered sugar and cream cheese. Fold in the Cool Whip. Spread on the completely cooled cookie crust. Cut up the fruit and arrange as the "toppings." Chill for one hour. 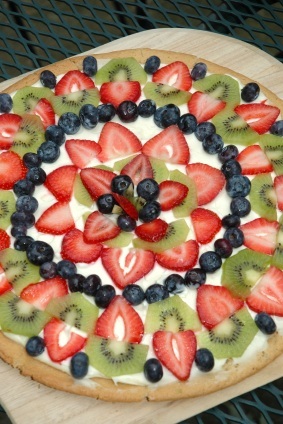 A wonderful fresh fruit pizza recipe. NOTE: Another great way to make this is using the rectangular pan is to use blueberries and strawberries to make an American flag. Use the blueberries as stars and strawberries as stripes. You may want to keep this easy fruit pizza recipe under lock and key....many will request it. Beat above ingredients together until it forms soft peaks. Use for the recipe "sauce." Fresh Fruit: bananas, kiwi, strawberries, grapes, pineapple, mandarin oranges and canned peaches. IMPORTANT TIP: Dunk the bananas in peach syrup to prevent browning. PREHEAT oven to 350 degrees, grease a pizza pan or cookie sheet. Slice the cookie dough into 1/4" pieces. Lay them on a greased pan and press them together until it forms one large "cookie." Bake for ten minutes or until light golden brown. Cool completely. When the crust is baking, grab a large bowl and mix together the vanilla, powdered sugar and cream cheese. Fold in the Cool Whip. Spread on the completely cooled cookie crust. Cut up the fruit and arrange as the "toppings." Chill for one hour. NOTE: Another great way to make this is using the rectangular pan is to use blueberries and strawberries to make an American flag. Use the blueberries as stars and strawberries as stripes. Use peanut butter cookie dough as "crust." Then for the "sauce," you may add a couple tablespoons of peanut butter. Toppings? How does chopped Reese's peanut butter cups and chocolate sauce sound? delicious. The possibilities are endless.